We're not quite sure how this bike has evaded our bespoke bike radar until a mate of our in Italy brought it to our attention. We're glad he did. There isn't a great deal of info on the information superbikelane on Umberto Dei's bikes. Which is rather cool in a way. That is a trademark of truly bespoke products. "It happened in the year 1896. The Lumiere brothers had just invented cinematography and Guglielmo Marconi had created the wireless telephone when a little artisan, fond of cycling and extremely meticulous, made his first series of bicycles. His name was Umberto Dei. "That was the beginning of a marvellous adventure that led him to create a collection of bicycles which were considered among the best in the world. Their level of quality and perfection was so high that the brand Dei became world-known: everybody longed to have a Dei bycicle and win by riding it. "Umberto himself had a leading role in the track World Championships which was held in Berlin in 1901. 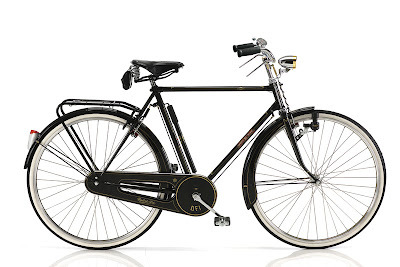 The Dei racing bicycles won everywhere and were on top of the scene for nearly half a century, receiving many honours in the most important cycle tracks of the world." The company now focuses on stylish city bikes that easily rank high in the burgeoning luxury bike market. Above is the Imperiale Uomo - what a fantastic name. The list price is €1300, which is not at all bad for such fine lines and quality. We're itching to get our hands on one.